I did it! I completed my first whole week of Whole 30! I'm going to recap each week a bit like a "bump date" sharing some of the highs and lows throughout the process as well as some of my favorite meals I've put together throughout the week. If you have decided to go through this process with me, please share and comment below. I would love to hear what day you are on and how you are faring so far. If you can recommend any good recipes, I'm all ears! Best Part of the Week: The best part of the week was definitely Day 4 when my headaches subsided. Going without caffeine and sugar took a toll on my body, opening my eyes to just how reliant I have become on those two substances. Hardest Part of the Week: Going out to eat with old friends. I got to meet up with my 2 best friends from high school Tuesday night and it was really difficult to figure out what I could eat on the menu. I learned Monday that many salad dressings contain either dairy or sugar so I avoided salad. I ended up getting a grilled/smoked pork chop, pickled okra, and sauteed vegetables. It was delish! Loving: Chai tea! It has enough caffeine to give me a kickstart and to subdue my headaches. It tastes so good I don't miss my flavored creamers or sweeteners. Missing: Milk. I love milk. I would drink it with dinner each night. I've Noticed: I'm sleeping so much more soundly at night. I wake up in the morning feeling well rested. Not to mention, my energy levels are much higher than normal. Typically I start to get tired around 7:00 at night (after school, workouts, dinner) and this week I have been able to do many household chores throughout the week that I would normally take care of on Sunday because I'm not as sluggish. Looking Forward: I'm excited to see how I feel the rest of the week. I feel "lighter" (not talking weight-wise) in general and I'm excited to see how good that makes me feel. Overall, I'm excited to not feel controlled or bogged down by food. 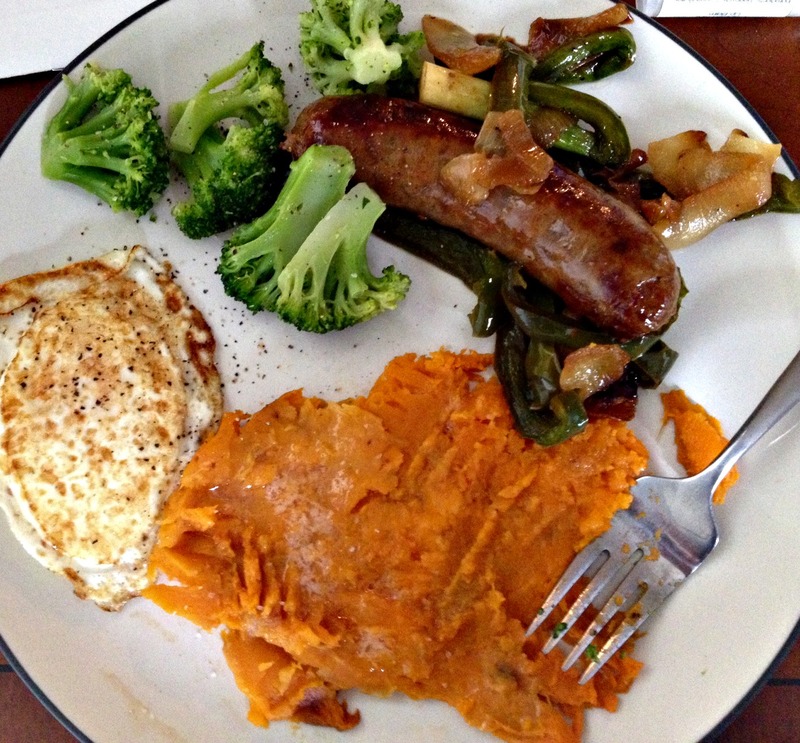 Sausage, sauteed green peppers and onions, steamed broccoli, a fried egg, and a baked sweet potato left me very satisfied. My main concern was whether or not I would feel full and I ended up not being able to eat it all. It's important to note: on Whole 30 you are not allowed potatoes, but you are allowed sweet potatoes. Honestly, I have enjoyed them! I was craving tacos. I just made my tacos without shells. Honestly, I was afraid I would miss the crunch and I didn't...not even a little bit. 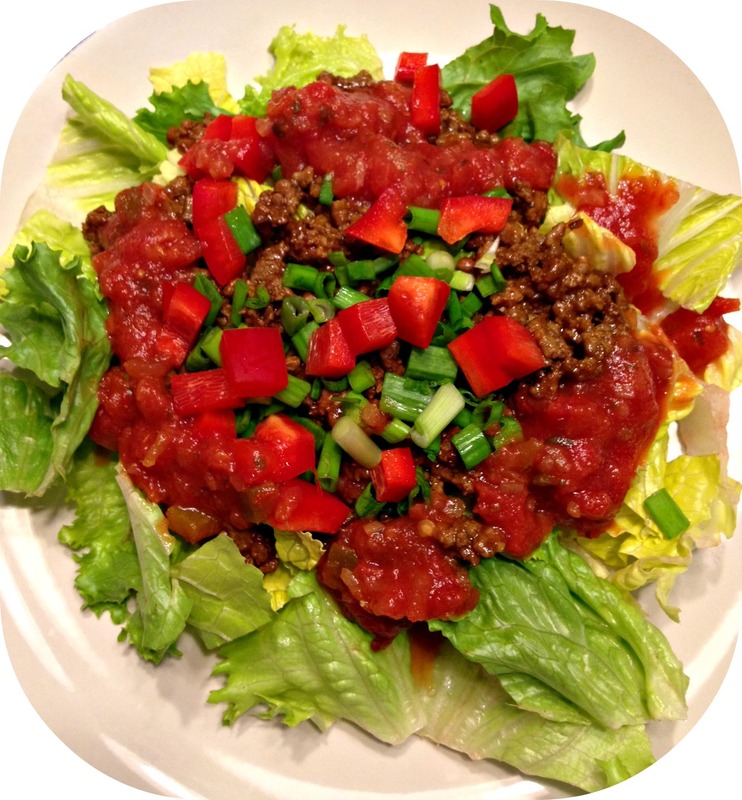 I had plenty of romaine lettuce, red peppers, and green onions on there to make up for it. I didn't even think twice about the cheese - try it - you won't even notice its missing. Salsa made for a great dressing as well. For breakfast, I've been sticking to juicing and fruit. I eat lunch at 10:30 at school so fruit/juice keeps me nourished until then. I usually bring another piece of fruit to have on my 2:00 planning since there is a large gap in time between lunch and dinner at home. In the evenings, I snack on more fruit or I have some sunflower seeds or pistachios. I've noticed that I'm not craving a snack as often as I used to. YAY! Congrats on a week. I just completed week three. I cheated around Easter so I feel like its pointless but I have had so much more energy from not eating grains! So awesome! Makes me wanna try it. With a picky husband & two irratic schedules it's just not very feasible. But then there's the part that I cook with crazy ingredients all day & have to try it. Good luck girl! We still need to meet up soon!! awesome work!! The first week is definitely the toughest, since you've survived it I think you'll be smooth sailing to day 30! I have heard such great things about this plan. I am not sure I could make it without Diet Dr. Pepper!! I am so proud of you for making it through week one!! Can't wait to see what else it has in store for you!! ROCK IT, girl! Own it!! yay im so proud of you, get it girl! So proud of you!! I had good days and bad...but for the most part it felt good and even though I've reallowed most foods back into my system, I have found I'm not craving them like I did and I can make smarter decisions knowing exactly what is in food! Can't wait to keep reading your updates! Yay for such awesome results! I'm proud of you! I'm so glad your headaches are gone!!! Great job on week one! I am realizing I had made a lot of changes that are a part of the whole 30 already but I'm not ready to give up my cheese just yet! Love the progress report. Pop over for a visit sometime! super excited that in are in for the challenge!!!!!! looking forward to seeing your posts. :) e-mail me any links! I want to try this Whole 30 so bad, but can I be honest and tell you I am such a wuss! !